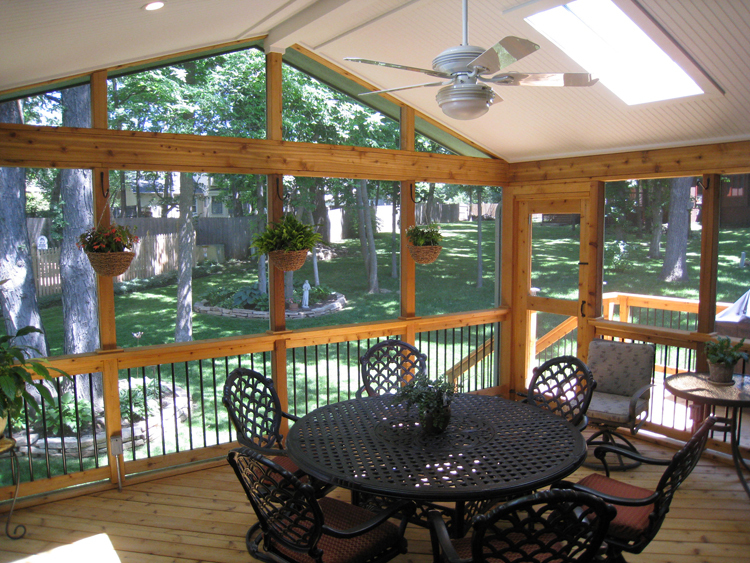 Which month is one of the most ideal months to build a screened porch? Here are the top 5 reasons that the fall is a great month to get started on adding a screened porch, 3-season porch or sunroom to your home. The weather in Kansas City is different every year. While some years it’s not hot enough really enjoy the refuge of a screened porch until spring, in other years you may be ready to begin enjoying your porch in very early spring. Building your screened porch in the fall ensures that your new screened porch is ready for enjoyment no matter when the temperatures heat up for spring. 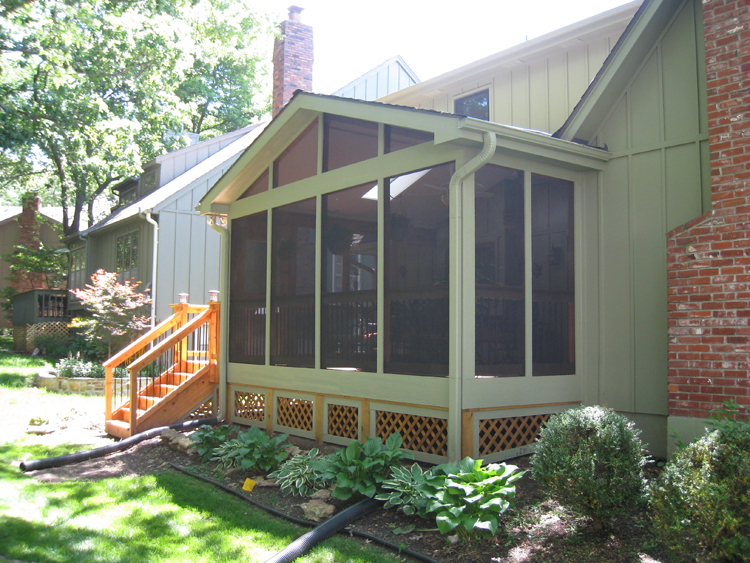 Many of our customers tell us that they enjoy their screened porch well into the colder months. There are many great electric and natural gas space heaters on the market that will provide enough heat to enjoy your porch in cooler months. If you have a multi-season porch, year round enjoyment is made possible with the help of a space heater. The optimal time to do landscaping is later in the fall so it’s not so hot and your new landscaping is going to take root best. Building your porch in the fall helps to ensure that you have minimal interruption of your landscaping. In the fall, the ground is firmer because of less rain resulting in less disruption to your landscaping. As the housing recovery accelerates which it’s doing which it’s doing around the country, prices of building materials go up. The longer you wait, the higher materials will be priced. They’re based on supply and demand on national level which is highly dependent on the housing market. Building materials manufacturers often announce their price increases at the first of the year. By building in the fall, you can take advantage of the lower prices. Everyone wants to build their new outdoor room in the spring. As you can imagine, the construction schedule for reputable builders may require project start dates that are weeks out delaying the time you can begin to enjoy your new porch. In addition to longer wait times in the spring, long bailout times are accentuated by heavy rain which is more prevalent in the spring. Another consideration is to sign up in the fall to start building early in the coming year. This allows you to get ahead of the spring rush, allows you to build while the ground is still firm, and we may be able to take advantage of the lower costs of building supplies if you sign a contract before the new year. If you are considering adding a porch or covered room to your Kansas City area home, give us a call. Our consultation is completely free. Give us a call at (913) 851 – 3325 or email us at kansascity@archadeck.net. We look forward to your call. This entry was posted in porches, Screen Porches and tagged Archadeck of Kansas City, Kansas City porch builder, Kansas City screened porches, Overland Park porch builder, Screen Porches on August 28, 2012 by archadeckkansascity. You might not think this is the case but sometimes the longer the fine print, the less you’re getting. There can often be hidden costs to look out for in the specifications list, warranty, or other details found within your proposal or contract. Here are a couple of things to watch for. You want to be careful if the list of specifications or details about a component are too confusing/not written in a clear and straightforward manner, too vague, or stated verbally. Beware if you receive contracts, estimates, addendums, specifications sheets or other documentation that is confusing or is not written in a way that is easily understandable and digestible. For example, if there are multiple options with associated prices within your contract, it may be difficult for you to designate what your selections are and which selections you are not choosing. In contrast to the next point, be wary if there is too much fine print or the documentation is confusing. This may be done intentionally to slip in hidden costs or specifications that are not in agreement with your expectations. Think about all of the construction materials that it will require to build your new porch or deck or outdoor structure. Imagine those materials being delivered and sitting out in your back yard. Now imagine the options available with each of those materials. There are a number of different types of wood that can be used. There are a number of different screws that can be used. There are hundreds of options in construction materials that differ greatly. Has your contractor discussed these options with you? Now imagine that same set of building materials and imagine the number of different ways those can be assembled. In addition to materials, there are construction details that need to be specified. Look for items in the specifications that are purposefully vague such as “48 feet of standard railing”. Even a railing has lots of facets including pickets, posts, and even screws. Insufficient explanations of choices and options may indicate the contractor is going to use the cheapest options to get the price down but this reflects on durability, upkeep, maintenance. Watch out for verbal promises that your new porch or deck will be “the same” as someone else’s, or the same as another picture. Beware if they continually lead you to focus on the size of the structure and not the hundreds of variables that are included. You may feel that you are not qualified to read and understand all of the details or fine print in your construction contract and at first, the details may seem foreign to you. But, it’s your job to ask lots of detailed questions. Sit down with your contractor and the contract. Go through the contract and other details line-by-line. A reputable contractor with nothing to hide will gladly discuss each detail as well as other options that are available. This also creates an excellent opportunity to make any critical changes before the project begins. In addition, do your due diligence. Research how these different methods and products perform and why they perform this way. If the contractor tries to pressure you to sign the contract before you’ve had time to do your due diligence, beware that there is likely a reason. This entry was posted in Choosing a contractor and tagged Archadeck of Kansas City, choosing a contractor, Kansas City contractor, Kansas City deck builder, Kansas City porch builder, Overland Park contractor, Overland Park deck builder, Overland Park porch builder on April 25, 2012 by archadeckkansascity.